Laravel is a modern framework for building web applications in PHP. It aims to make the development process a pleasing one for the developer without sacrificing application functionality. DeployBot fits nicely with this philosophy — we believe that your deployment process should scale easily to accommodate for your infrastructure growth. In this deployment guide, we'll show you how to use DeployBot's tools for bug-free continuous integration to configure zero-downtime deployments for a Laravel app to a DigitalOcean droplet. 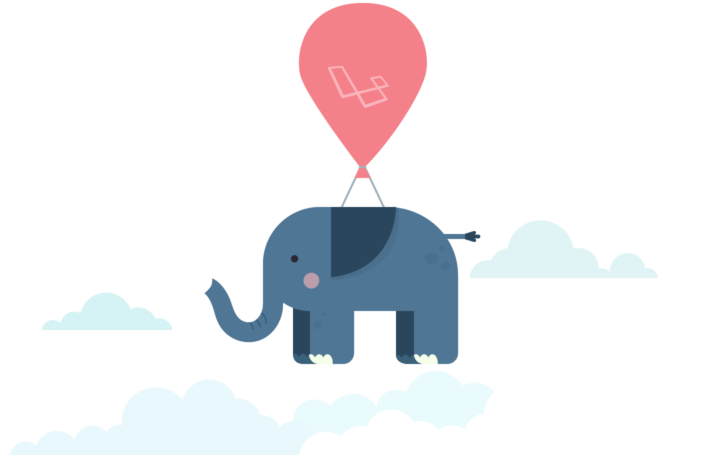 We’ve taken the Laravel’s official website as an example for this guide. While it’s far from the largest Laravel app in the wild, and your own Laravel setup may differ slightly, this open-source project based on Laravel 5 is quite representative in terms of the setup process. You should be able to apply these instructions to your own projects without a problem. 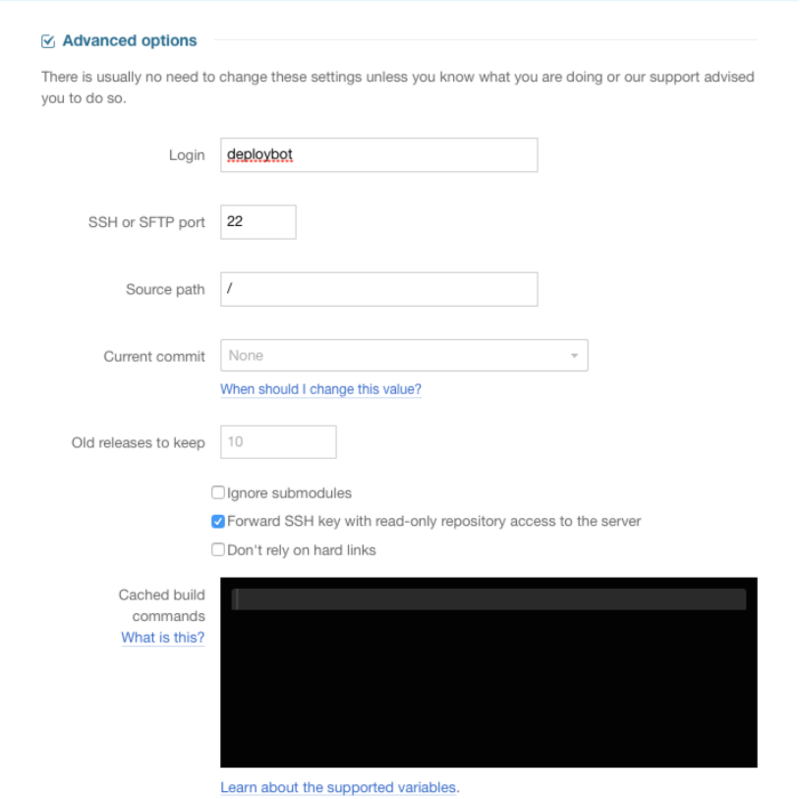 To get started, proceed to DigitalOcean and create a new account, unless you already have one. Their prices start at $5/month for a virtual machine with 512MB RAM and 20GB solid-state drive. Select the appropriate droplet size depending on your needs and budget, then start with a fresh “Ubuntu LEMP on 14.04” image. LEMP stands for Linux, Nginx, MySQL and PHP, which combined give you a solid foundation for a modern PHP app deployment. Don’t worry if your application requirements are not standard, you can still use DeployBot. In that case, however, you might have to adjust some paths or commands if you’re not following our instructions precisely. Open the terminal of your newly created droplet using the DigitalOcean web interface or by connecting via SSH. The VM will greet you with an informational message also containing the pre-set root password for MySQL. # Welcome to the MySQL monitor. Commands end with ; or \g. # Type ‘exit’ (Ctrl+D) to quit the MySQL console. The LEMP droplet is configured in a way that all web services are run by user www-data, a member of www-data group. Generally you’ll want your application files to be writable by your deployment user only, limiting www-data to read access except for when the write permissions are required (logging, file uploads, caching, etc). Now you need to pick up the directory where your web app files are going to be stored (for instance, /var/www/example.com). It has to be readable by the members of www-data group, but only writable by the deployment user. Note the 2755 access mode. It is recommended that you set the GUID bit on the application directory. This way all files created inside it will be automatically owned by group www-data (with read-only access). The LEMP droplet comes with acceptable PHP configuration defaults. However, there is one little piece missing. To run Laravel, you’ll need to enable the mcrypt extension for PHP. Please pay extra attention to the root path and the fastcgi_pass value. The latter should match the listen value specified in the pool settings of php5-fpm (/etc/php5/fpm/pool.d/www.conf by default). Note that we’re using $realpath_root nginx variable which will resolve the current release symlink to the actual release path to avoid issues with PHP opcode caching. Once you’re done editing, make the config visible to the web server by creating a symlink to it in the /etc/nginx/sites-enabled/ directory and restart nginx. To avoid conflicts, remove the default example site first. Log in to your DeployBot account and connect a repository with your Laravel project in it. Then create a new environment. 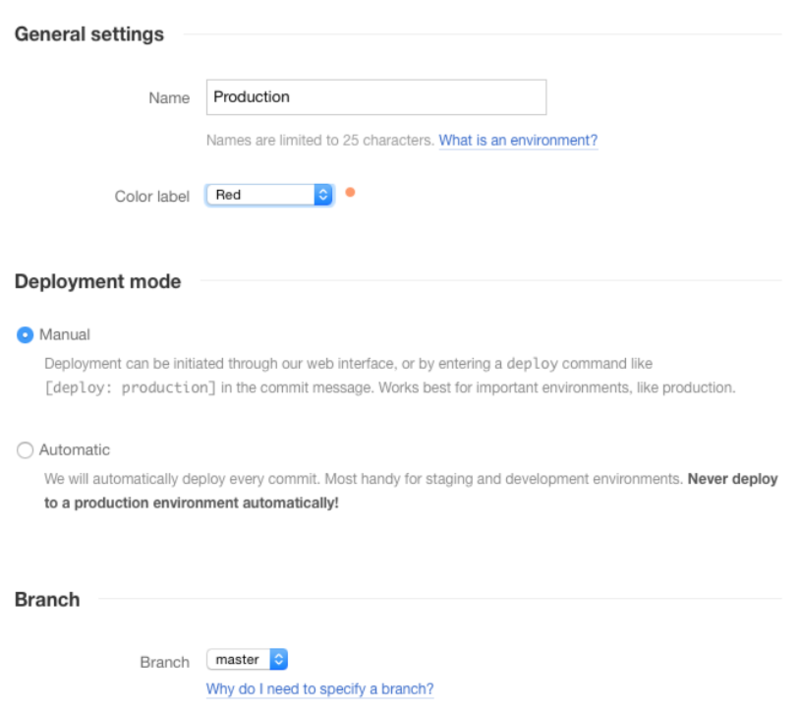 If you’re deploying to production, it’s preferable that you keep it in manual mode. Time to add a target server — choose atomic deployments to DigitalOcean. Atomic deployments are designed so that there’s zero downtime during a deployment. Your deployments either happen completely or not at all, and the previous code keeps running if the deployment goes bad. Atomic deployments use SSH, which is widely trusted and supported. Follow the instructions presented by the app to connect DeployBot to your DigitalOcean account. Name: a distinctive identifier of your server (the droplet name is a good choice). This would be sufficient to deploy the application files, but, since you’re deploying a Laravel app, you’ll need to run some commands after uploading a new version. The following script will create all required shared directories, install application dependencies and run the migrations. Feel free to adjust it to your application’s needs and save it under "Run commands after new version is uploaded". The last configuration change you’ll normally want to make is to exclude the vendor directory from deployment. Find the “Exclude certain paths from being uploaded” section and type “vendor” on the first line. Finally, click “Save changes”. You should be redirected to the environment deploy history. From here you’re ready to trigger your first deployment. 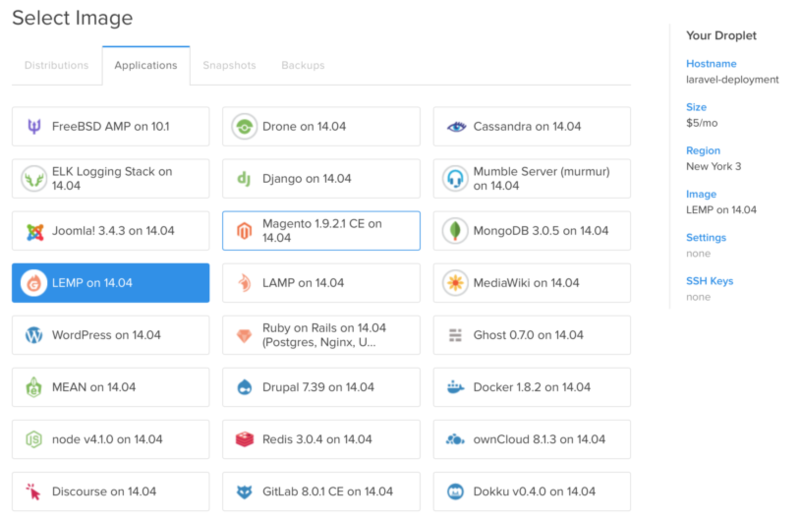 Click “Deploy”, walk through the wizard and deploy the app to your server. If everything is configured correctly, after the deployment is finished, you should be able to access your app via the web browser using the IP address shown in DigitalOcean settings. Using Elixir, Gulp, Grunt, or any other task runner to build & minify your application assets? There is no need to pollute your Git history with compiled versions! Instead, you could use DeployBot’s build tools to automatically build everything using our infrastructure on every deployment. After you do this, update the “Exclude certain paths from being uploaded” section with node_modules directory to avoid uploading installed Node.js dependencies to your server. And that’s all you need to do! Now your assets will be built and uploaded to your server automatically on every deployment. If you’re using a task runner different than Gulp, or have any additional questions on the topic, check out our dedicated guide on building assets. Now that your deployment process is automated, you may relax a bit and trigger a few re-deploys to ensure that everything works as expected. 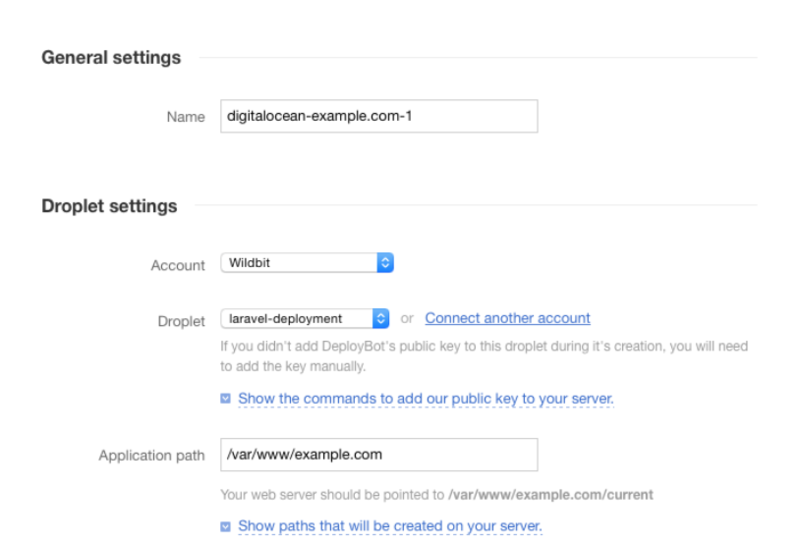 We hope you found this guide useful and were able to successfully deploy Laravel to DigitalOcean with Deploybot. Take some additional recommended steps for new Ubuntu 14.04 servers.